We've had The Popcorn Factory brand before. It was gifted to us for Christmas from friends last year, and I do have to say, it is mm, hmmm, good. If you're a popcorn lover too, then this is the giveaway for you! And it's not just popcorn! Keep reading to learn more. 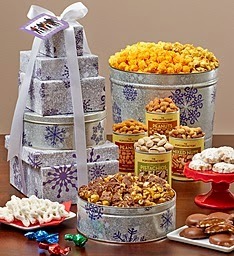 A superb line-up of tantalizing holiday treats can be found in our Snowflake Tin & Tower. 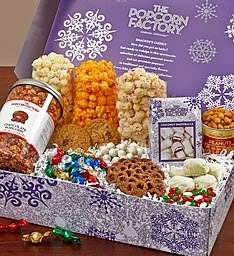 7-tier Tower includes Hard Sour Candies, Butter Pecan Cookies, Mini Snowflake Pretzels, a tin of Drizzled Caramel Corn, Pixies®, Natural Pistachios, Spicy Peanuts, Honey-roasted Peanuts, Fancy Mixed Nuts and a 2-gallon, 3-flavor tin packed with Butter, Cheese & Caramel popcorn goodness. APPROXIMATE HEIGHT OF TIN & TOWER: 18"
SHIPPING BOX MEASURES: 10 5/8 X 10 5/8 X 22 1/2"
No two snowflakes are ever the same, but the reaction of receiving our Snacker’s Choice Gift Box always is… sheer joy! We pack if full of Soft Baked Chocolate Chunk Cookies, Christmas Jelly Beans, Spicy Peanuts, Hard Sour Candies, Chocolate Toffee Pretzels, Candy Cane Caramels, Coconut Snowballs and four flavors of gourmet popcorn cheer: Cheese, White Cheddar, White Chocolate Peppermint Kettle and a mini-canister of Chocolate Kettle. 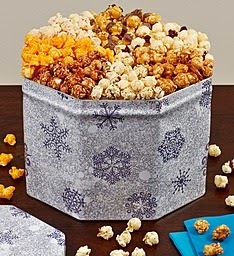 GIFT BOX MEASURES: 18 X 11 1/2 X 4 1/2"
SHIPPING BOX MEASURES: 18 1/2 X 12 X 5"
The perfect gift for any popcorn lover, our 7-Way Popcorn Tin is loaded with seven flavors of gourmet popcorn cheer: Chocolate, Cracked Pepper & Sea Salt, Cheese, Drizzled Caramel, Cranberry, Butter Toffee Almond Pretzel Mix and White Chocolate & Peppermint Kettle. Working with The Popcorn Factory in 2014 has been a true pleasure. I look forward in working with them even more in 2015. This giveaway will end at 12:00 AM (EST) 12/12/14. That would make a nice gift for a couple of our friends. I never know what to buy them.